The mild and pleasant climate in central Tibet makes this area available for tourists year around. This route offers the epitome of Tibet with some of the most impressive visions: snow-capped mountains and holy lakes, splendid monasteries and palaces, major cultural center cities, original villages and unsophisticated people. 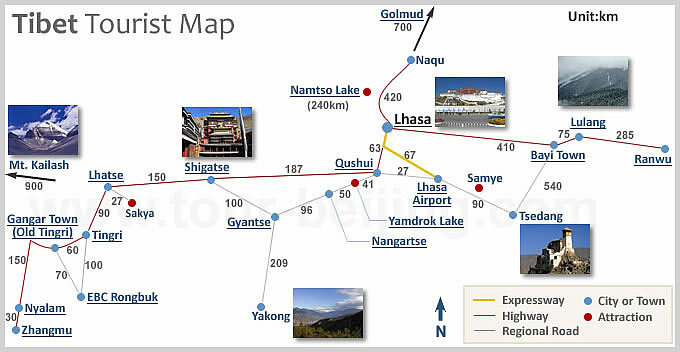 With the better road conditions and nice accommodations, it is now the most popular route for Tibet Tour. - The views of the Potala Palace from the rooftop of Jokhang Temple is breathtaking. Your guide will definitely take you there for great photos. Today’s drive is around 360km / 6.5hrs . In the morning, You will visit the second most important temple in Tibet, Tashilhunpo Temple. Afterwards drive back to Lhasa, taking the main-friendship high way by the side of the Yalung Tsangpo River and Enjoy the breathtaking scenery on the way.